Even before he departed for Australia, Ludwig Leichhardt kept in touch with his family via letters written during his travels. Between 23 March 1842 and 22 February 1848, he sent 17 letters back home from Australia; these letters document the period from his arrival on the continent until the disappearance of his final expedition. Leichhardt’s letters are an important source of information about his experiences, plans, and everyday concerns, as well as securing his reputation as a scientist. Like Leichhardt’s correspondence with important scholars of the time, some of his letters to his family have also reached a wide audience: they have been published in academic journals including The London Journal of Botany, Monatsberichte über die Verhandlungen der Gesellschaft für Erdkunde zu Berlin, and Fortschritte der Geographie und Naturgeschichte. In 1907 the geophysicist Georg von Neumayer gave the collection of letters to the archive of the Deutsches Museum in Munich. 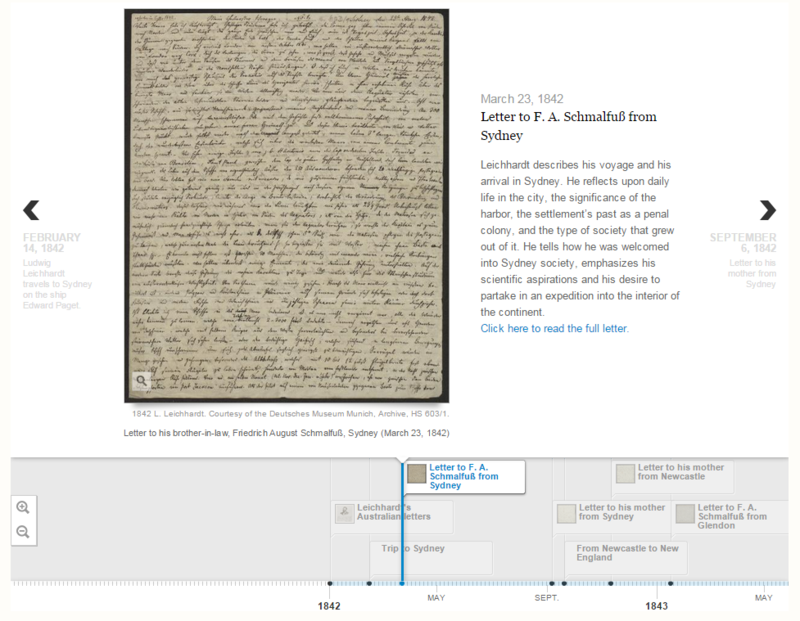 Click on this image to view the timeline of Ludwig Leichhardt’s travels and to read his letters. All letters have been used with the permission of the Deutsches Museum, Archives, Munich. For a chronological list of Leichhardt’s letters, please visit this page.